What is the Projected Internal Rate of Return of AIA SmartRewards Saver Insurance Endowment? I was at a stage where I was unsure if insurance endowment plans are really that bad for wealth building. So I crowd-sourced from friends, family members, relatives their past matured policies. And I put them in one nice article. The summary is shown above. While the duration is different, the pitch by agents are different, the amount of premiums are different, if we compute the internal rate of return (XIRR) of the stream of cash inflows and cash outflows we can compare against each other. So a reader was thinking of purchasing this AIA SmartRewards Saver. I told him I cannot added it to this list as it hasn’t matured yet. This list only shows the real results not the projected ones. However, I can value add to him to calculate the projected rate of returns based on what the insurance company pitched. The AIA SmartRewards Saver is an insurance endowment plan. It’s primarily objective is to help you save. However it seems that there is an insurance element to it. So this is a savings plan. Suppose the assured passed away before the maturity year, the plan will payout the higher of the insured amount (in this case $100,000) or the total premiums paid up to that point. So if the assured passed away at a certain point, usually at the earlier years, the plan provides a payout higher than your premiums paid. So how do we determine whether the plan is worth it from a saving and wealth building perspective? 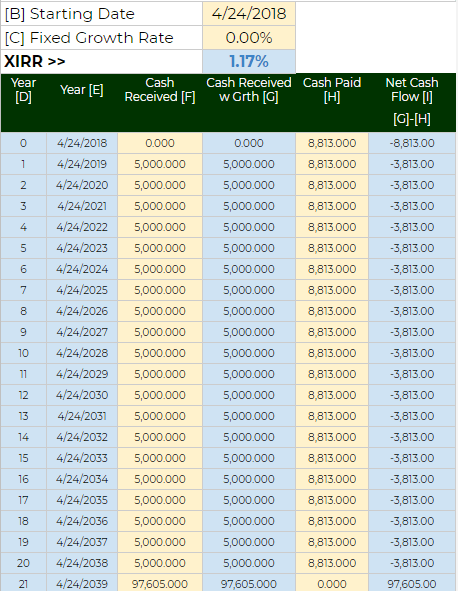 Basically, you can imagine that the IRR is the “annual interest” that you are getting from this SmartRewards “bank” if you keep putting money into it. Usually, insurance company provides 2 projections, the conservative one at 3.25% investment returns, and the less conservative one 4.75% investment returns. In XIRR, we tried to base it on the cash flow that they say will come. In year 21, you will receive $25,000 plus the non guaranteed portion. To know whether this is rewarding enough, we compare it to some risk free return. That is usually the 10 year Singapore Government Bond rate. The XIRR of the AIA SmartRewards look very unappealing. You could have just kept buying 1 year maturity Singapore government bonds! 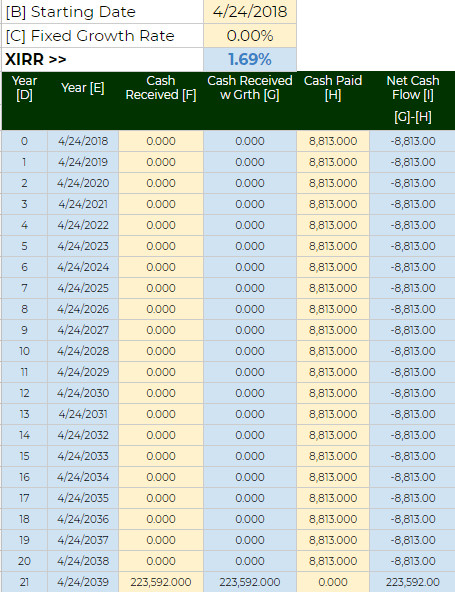 Even the Singapore Savings Bonds (SSB), which is based on Singapore government Bonds yield 1.6% to 2.39% for the month of May 2018. 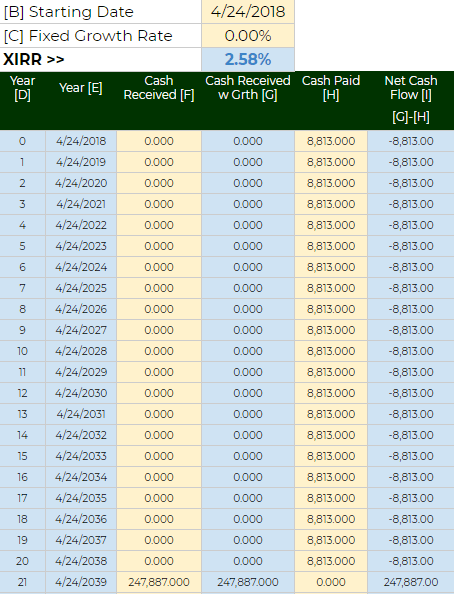 The non guaranteed returns can grow at a higher rate of return and in this case the XIRR becomes 2.53%. This is slightly above the 10 year SGS bond rates and SSB bond rates of 2.488% and 2.39% respectively. 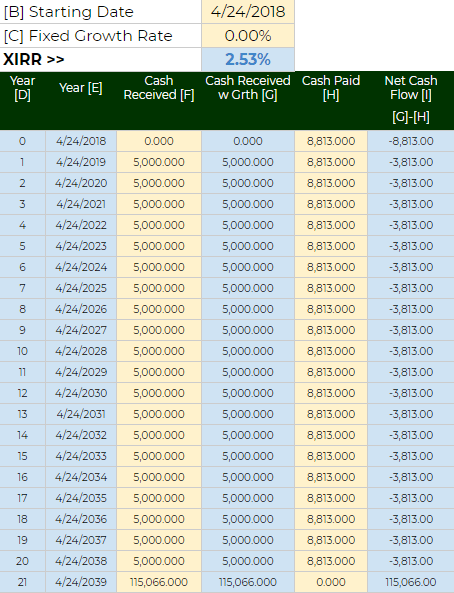 For scheme 2, the cash flow is different. You will only receive something at the end. Strangely, the XIRR is only slightly better than Scheme 1 at 2.58%. From what AIA is projecting, not good! However, they tend to litter some other benefits. These plans works best if the assured passed away earlier than later.Then your insured payout is more than the savings. The actuary at the insurance company assess that the risk of that event is low. Look at this another way, should some out of wack probability stuff happened to you, you get the premium waiver and do not have to pay subsequent premiums. I wrote about premium wavier last time that it is an insurance on the stream of premiums you paid. You can read up about it. You essentially pay a premium for this insurance cover so its not something special. In this case study, the sum assured is $100,000. It looks like a good benefit. However in truth, you can look at it as replacing this plan with a Singapore Government bond ladder and a $100,000 term life insurance. DIY Insurance, which is an online portal that lets you compare different kinds of insurance against their peers, and lets you buy it off the portal. The folks behind it are Providend, which is a fee-only financial advisory firm. I covered on a recurring basis the cheapest term life insurance and critical illness plans. 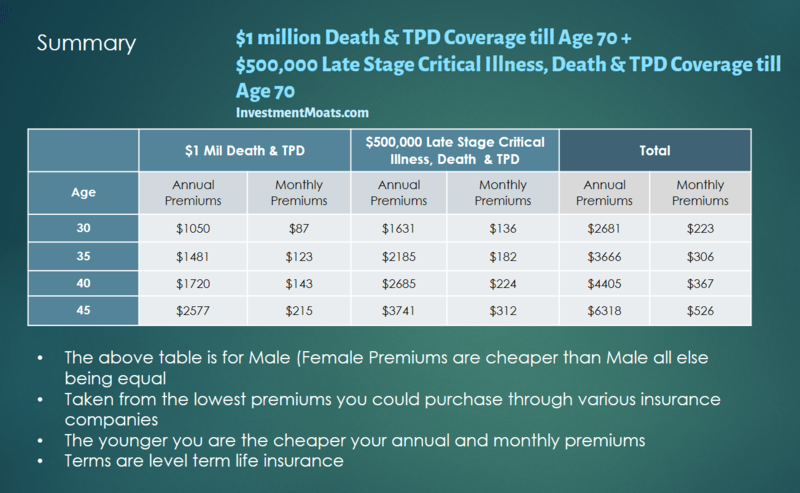 The table above summarizes the premium cost from the most affordable insurance company. While the premiums are for $1 mil, you can get less coverage. So if you are 35 years old, your annual premiums will be $1481 /10 = $148/yr. In truth, if your coverage is less than $400,000, DIY insurance will advise you not to get it from them, but to get it directly under Direct Purchase Insurance (DPI). It is a scheme which forced the insurance company to offer a non-advisory term and whole life insurance directly from the insurance company. The premiums tend to be cheaper. And it is likely going to be less than the $148/yr. $148/yr is 1.67% of your $8813/yr premium. So are any of you guys on this plan? What are your thoughts? This article is a collaboration between Investment Moats and DIYInsurance. The views are of InvestmentMoats.com alone. I am an existing customer of DIYInsurance and recommend DIYInsurance due to the quality of the product, the service and the integrity of the people behind it. historically, how many of the plans pay out 3.25% – 4.75%? 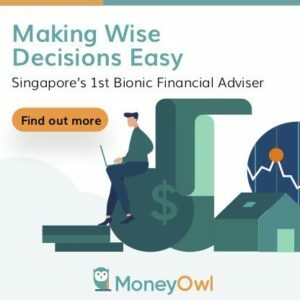 Financial Planners will try to promise you the world, saying they will fulfill the non-G component.. but there is reason, why it is stated as non-G in the first place. yes, granted it is locked up till 60+. but thats the point of savings plan? since most of them require you to be locked up for up to 25 years. personally, for me, unless the plan can better the CPFSA of 4%, (which is somewhat 99.9% guaranteed, until the policy changes) otherwise, i would not bother too much with saving plans from insurers. the next best, as you mentioned will be the SSB or SGS. at least its guaranteed for the next 10 years. Hi FC, i think i have some beef if you are looking at only guaranteed. its not suppose to be as such. its like you are looking for an investment with guaranteed returns and say the upside is “not required” but “good to have”. I do not think it is. the 3.25% and 4.75% is not the returns that you get but the returns of the participating funds. we are probably saying this now because of how visible and transparent the ssb and sgs is. but think about it. if the rates are higher, wouldnt that mean the bonds the funds invest in from now onwards, newly vested be higher as well? This might not be related to the blog post but what are your thoughts on the acquisition on 21 properties and the increase of the portfolio size of Frasers Logistics by about 50%. announced recently ? Not sure if I wanna write about it since a lot of people shared their views. It increases the number of properties, expose more regions. The CAP rate is lower than other regions. I think it gives the REIT a better profile and benefits the manager more than us. But we should see the quality over time.